Sometimes it’s important to know what version of Mac OS X your users are running, especially when making decisions on what versions of OS X to support in future software releases. In the case of Seasonality 2.0, I have decided to take advantage of all the developer changes in Leopard, both to make Seasonality a better application, and to shorten my development time (thus giving me more time to work on additional features). Previously, I haven’t performed any OS statistics on user data. It would be easy to do, since Seasonality downloads forecast and image data from a web server here at Gaucho Software, but I haven’t written the code required. However, some of these Seasonality data requests are using the typical CFNetwork methods of downloading data, and these connections provide the current CFNetwork version in the HTTP UserAgent, and thus will show up in my web server logs. The problem is that I have been unable to find any kind mapping between CFNetwork versions and the corresponding version of Mac OS X. I decided to take it upon myself to generate (and hopefully maintain) such a list here. Most of this data is from viewing the Darwin source code on Apple’s web site, but some of these are just from personal observations, and some are educated guesses (marked with a question mark). CFNetwork/221.2 Mac OS X 10.5.2 Developer Seed? CFNetwork/220 Mac OS X 10.5.1? CFNetwork/217 Mac OS X 10.5? Edit: A more modern list of UserAgents can be found here. I’ll be adding feeds for Dash Monitors and XRG when I work on porting them to Intel in the coming months. In the mean time, any app updates for either of them will be posted to the Gaucho Software news feed. Flip pointed out this very cool new online music streaming site, Pandora. I’ve been trying it out this morning, and I’m pretty impressed so far. The stream is a reasonable quality (128kbps) and the songs picked have been pretty accurate so far. Best of all, it’s free. I guess they plan to pay for the music licensing by selling ads for free account users. If you purchase a paid membership, you can ditch the ads for $36/year. How do you organize your feeds? Let me just say this right now, if you aren’t using some kind of news aggregator to read this, then get one. The amount of time you’ll save is priceless, and almost half of my web browsing now happens in NetNewsWire, not Safari. 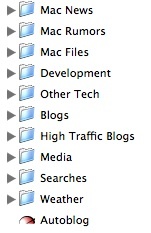 So Mike Zornek brings up a good Question of the Day: how do you manage your RSS feeds? Well, my feed list is grouped in the categories listed on the right. The first three are pretty simple, everything happening relating to the Mac I can keep track of here. Good to keep tabs on the market. Blogs, well not much to say here, but I do split some blogs that post very often out into another group. I’ll always read the blogs group, but if I’m running short on time I’ll skip over High Traffic Blogs for the time being. Media has Flickr and Podcast feeds which I see as a kind of extension of the idea of a blog. Searches are custom NNW search term feeds. Weather isn’t what you might expect, it includes feeds by the National Weather Service to keep me updated on changes in their data sources and a few other weather sites as well. Seasonality keeps track of my weather for me, so I’ve never really had a need to use RSS for that. Finally, below that is any other subscriptions that don’t fit anywhere else (or are temporary). Right now I just have Autoblog there, because it doesn’t fit into any category, but is still an interesting read. So this is what works for me. I’m not sure what I would do without feed grouping… There are just so many feeds out there that having one large list just doesn’t make sense. Fellow Mid-Michigan blogger, Logtar, posted a nice guide for password management and selection. I think it’s important to inform people of ways to choose good passwords because so many people pick easy passwords that are simple to crack. It used to be that someone could just compromise a system if a user selected a bad password, but now with online banking and stores like Amazon storing your credit card information by default, there is a lot more to lose.